t was many years before a United States stamp featured a coin in the design. The American Bicentennial series of coins included stamps honoring heroes of the Revolutionary period. One such stamp honored Haym Salomon, a merchant who lent money and supplies to the Revolutionary militia. Issued in 1975, the stamp  Scott (the standard stamp reference) No. 1561  shows Salomon and a few Spanish colonial coins, which were the coins of the time in the colonies. The next stamp to feature coins was a pair of attached stamps, Scott Nos. 1577-1578. They honored centennial of the American Banking Association in 1975. They show portions of a Morgan silver dollar, a $20 Liberty gold coin, a seated Liberty quarter and an Indian Head cent dated 1875. The use of the Morgan dollar is odd, since the first one was not issued until 1878, three years after the ABA's founding. They could have shown an 1875 seated Liberty dollar or a Trade dollar. 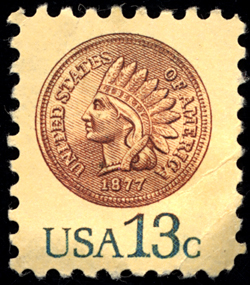 In 1978, a regular-issue 13-cent stamp featured an 1877 Indian head cent. It was a smaller than the usual stamp size, possibly to save paper and space. It is Scott No. 1734. In 1981, an 18-cent stamp was issued to honor the Savings and Loan Association's 150th anniversary. It is Scott No. 1911 and features three coins, all going into a house-shaped coin box: a buffalo nickel, a Barber dime and an Indian Head cent. In 1984 a stamp was issued honoring the 50th anniversary of the Federal Credit Union Act. A portion of a Roosevelt dime is shown. It is Scott No. 2075. The last stamp to feature coinage is the 29-cent 1991 centennial issue of the American Numismatic Association  simply stated as "Numismatics." The ANA was founded in 1891. It features a portion of a Flying Eagle cent (1856-1858) and a portion of a $20 Saint-Gaudens gold coin. Here, too, a more appropriate gold coin would have been an 1891 $20 Liberty head coin. The first Saint-Gaudens gold coin was issued in 1907. The one-cent coin also should have been an 1891 Indian Head cent. To a collector who enjoys both coins and stamps, these stamps can be purchased from any stamp dealer for about double the face value of $1.10.